Real Madrid already qualified for the tournament, having won the UEFA Champions League, but who will join them? The Club World Cup is set to make its return in December in the United Arab Emirates. Four of the seven competing clubs are already known, with the others to be confirmed in the coming weeks before the tournament kicks off on December 6. With the competition approaching, Goal takes a look at everything you need to know ahead of the opening fixtures. WHAT IS THE CLUB WORLD CUP? The Club World Cup, as the name suggests, crowns the world champions of club football. It is not as illustrious an event as the international World Cup in Europe because of the dominance of the UEFA Champions League, but is a more prized possession on other continents such as South America. It has been held in a number of different formats over the years. From 1960 to 2004, UEFA and CONMEBOL played the Intercontinental Cup, which saw the winners of the Champions League and the Copa Libertadores meet in a one-off final. FIFA introduced the Club World Cup in 2000, but various internal problems meant that the second edition was not played until 2005. That year, the decision was made to merge the Club World Cup with the Intercontinental Cup and it is now the sole decider of the club world champion. Real Madrid, the reigning world champions, booked their return to the competition by lifting the 2016-17 UEFA Champions League trophy. Madrid beat Mexican outfit Club America in the semi-finals of the 2016 Club World Cup, with Karim Benzema and Cristiano Ronaldo scoring the goals, before seeing off Kashima Antlers in the final. Ronaldo struck a hat-trick against the Japanese side and Real eventually won 4-2 after extra time. They go into this year's tournament as its first defending champions. Al Jazira will participate this year as national league champions from the host country, while Pachuca, Auckland City, Wydad Casablanca and Urawa Red Diamonds qualified as the continental champions of North America, Oceania, Africa and Asia respectively. But the biggest challenge to Madrid is likely to come from Gremio, who won the Copa Libertadores in South America. WHAT VENUES WILL BE USED? There will be two venues throughout the tournament: Zayed Sports City Stadium in Abu Dhabi and Hazza Bin Zayed Stadium in Al Ain. Zayed Sports City Stadium (pictured above) is the largest in the UAE, with more than 43,000 seats, and was the host of the Club World Cup final in 2009 and 2010. It will also hold the final of the 2018 Club World Cup. An open-air stadium, its arches carve an iconic backdrop in the city. The Hazza bin Zayed Stadium, opened in 2014, has a capacity of 22,717 and is a multi-purpose stadium which acts as the home for UAE Pro-League club Al Ain FC. 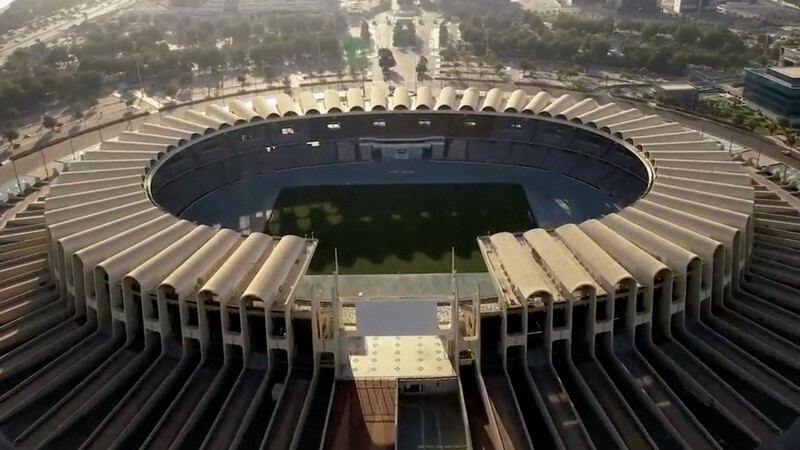 The stadium sits approximately 150 km east of Abu Dhabi, close to the borders of Oman, and is the first stadium to feature a parasol roof designed specifically to keep supporters and players cool in soaring temperatures. This year's tournament will kick off on December 6, with the opening tie of the tournament to be a play-off game between host-club Al Jazira and Auckland City. The quarter-final stage of the competition will be played on December 9, with the two semi-final games taking place on December 12 and 13 in Al Ain and Abu Dhabi, respectively. The final of the competition, also to be played in Abu Dhabi, will be on December 16 along with the third-place match. HOW CAN I WATCH THE CLUB WORLD CUP? In the UK, every match at the tournament will be available to watch live on Goal's Facebook page. In the US, the Club World Cup can be watched live and on-demand with fuboTV (7-day free trial).